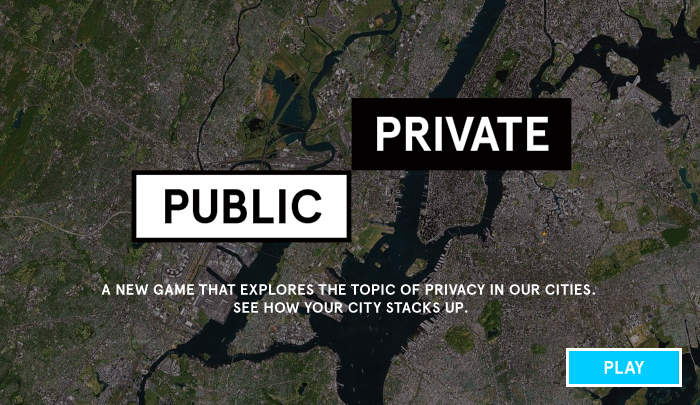 Public/Private is a game that explores the issue of privacy in our cities by focusing on where we spend our time. By choosing where in your city you seek privacy most often, you produce a visual graph representing those choices. Your graph is then combined with graphs generated by the rest of the global audience, creating a live data-visualization that illustrates how our experience of privacy changes at a local and global level. As more participants play Public/Private, more of the complexities of privacy in urban settings are illuminated. This game was created to accompany two ongoing research projects undertaken by the BMW Guggenheim Lab in Mumbai in cooperation with Partners for Urban Knowledge, Action & Research (PUKAR) and the Design Cell at the Kamla Raheja Vidyanidhi Institute for Architecture and Environmental Studies (KRVIA). The goal of these studies is to delve into the meaning and characteristics of privacy for city dwellers—and how that meaning might be addressed through design. The game experience for Public/Private was designed and developed by Collective Assembly and Tom van de Velde.